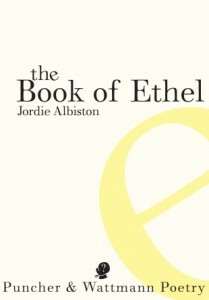 Jordie Albiston’s seventh poetry collection—the Book of Ethel—is a woman’s life journey delicately and diligently distilled into a slim volume of verse. Ethel is Albiston’s great grandmother, who immigrated to Australia from Cornwall with her family in the late 1800s at the age of fifteen. This is one of Albiston’s documentary poetry collections, following her previous Botany Bay Document (1996) and The Hanging of Jean Lee (1998), which both examined historical experiences of women, too. In 2011, Albiston travelled to Cornwall to study archival material and to discover for herself the place and culture Ethel grew up in. Ethel’s experiences are at once ordinary and extraordinary, adventurous and monotonous, unique and universal—yet always profoundly female. The narrative pulled me along and I sped through the book in one sitting, although I am sure it would be even more delightful to savour slowly, since the musicality of the words is as fascinating to the ear as the scenes the poetry depicts so vividly for the imagination. Each poem in the book is a vignette—a telling aspect of Ethel’s experience. The poems are untitled and there isn’t a single full-stop in the collection, so all that exists between the poems is space. This adds to the sense that they belong to one continuum, maintaining the flow of the story and the onward push of Ethel’s life. we Open onto same Page? In fact, the poems act like movements in a symphony, and Albiston’s approach to poetry is as meticulous as a metronome. She seems to distribute words at precise points along the line like musical notes, while white spaces act out the beats between them, and perfectly placed rhymes reverberate and chime. but not so fast beautiful! I was struck by how much these poems read like a libretto. So it wasn’t surprising to learn that Albiston is actually a flautist, and it’s no wonder her work has so often been set to music. As a poet, she writes in traditional forms as well as experimental forms of her own making to seek ‘musical cadence while endeavouring to exact a mathematical sense of existence’. Fascinatingly, each stanza in the Book of Ethel consists of seven lines, and the lines, in turn, each consist of exactly seven syllables. The way that Albiston manages to maintain eloquence of expression within such restrictive parameters seems to mirror the way in which women of Ethel’s era sought to find a sense of freedom within very limiting social structures and concepts of womanhood. sprats while sporting Sunday hat! Many of these poems observe difficulties faced by Ethel, her mother, or other women of the period—petitioning for the right to vote, doing dirty household chores in poor conditions, having to stay at home while the men were out seeing the country, being frequently uprooted for the sake of a husband’s career, struggling to make ends meet, raising large families and losing children. Ethel was rather remarkable in that, despite her many domestic and diplomatic duties as a reverend’s wife, she still found time to write, and in fact published a collection of short stories as well as had articles accepted by prestigious publications like The Spectator. I wonder if it was this writerly link that inspired Albiston to choose Ethel as her subject. Whatever it was, I’m thankful this story has been shared. Through chronicling one woman’s life, the Book of Ethel voices the experiences of a whole generation of women. And, in so doing, it tells a story that is foreign yet familiar, romantic yet realistic, banal at times but ultimately brave and beautiful. The Book of Ethel is published by Puncher & Wattmann. Bronwyn Lovell lives in Melbourne. Her poetry has been published in Australian Love Poems, Antipodes, Cordite Poetry Review and the Global Poetry Anthology. She has been shortlisted for the Newcastle Poetry Prize, the Bridport Prize, and the Montreal International Poetry Prize. This entry was posted in Arts, Books and tagged art, book of ethel, books, jordie albiston, lip verse, poetry, verse. Bookmark the permalink.